She had to do it. She had to put her pain and loss aside and exchange vows with a merman she couldn't even bear to look at, in order to save her people from war. That's what her mother would do, and that's what she would do, too. Serafina still wanted to trust him, to trust all of them. Thalassa had trusted them, it seemed. But they were Praedatori. Outlaws. Why would they help two princesses. "Serafina can't accept being the leader of her realm, because it means accepting that her mother is dead. It's only been a few days. She's lost everything. Everything, Ling. She needs time." "I can see that, Neela. But the thing is... we don't have any." How do I even begin to classify this book. Being my first Donnelly novel, I was surprised that I have never picked up anything by her previously. 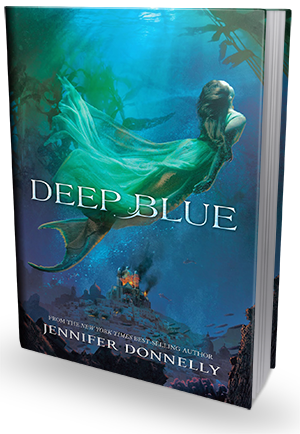 Maybe it is the Mermaid's or the wonderfully detailed world painted on the pages, but Donnelly's Deep Blue was for lack of a better word stunning. The beauty of this book lay within the beauty of the writing, The inside of the book matched the outside almost 100%. This is read is unique, even amongst all of the Mermaid reads that I have read. This is something that, I believe can be enjoyed by younger readers as well as older ones. Serafina, turned out to be an amazing character. She is one of the characters that you can watch grow from start to finish. She comes off a little stuck up and stubborn to start but she is a Princess... I am not saying this excuses her but there are certain things that she is just used to. However, like I said her growth happens as the book progresses. She grasps the seriousness of the situation and knows that she must step up in order to maybe help her people. She is also an incredibly loyal friend and someone that you want on your side because when it comes down to it she will figure out how to survive. Also she particularly grows when she is part of a group. It seems that this Princess may not believe she has the ability to lead but can give everyone the push needed when she has to. To start it looked like there was going to be a promising romance. Then it looked like there was going to be a turbulent romance... And then there was none. I am not sure if I was sad to see this happen or glad. 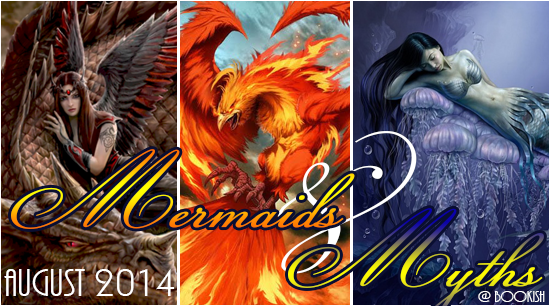 I believe a part of me expects it because it's a Mermaid read and romance is just a given... However, it is not always a given and though it was touched on mid book, the romance all but fizzled after that. This may have saddened my temporarily but it also killed the thought of the dreaded triangle. Now don't get me wrong I can like them but they must be done right, and when the focus of this moved more solidly to friendship/sisterhood, I was glad that there was not something to destroy it. Deep Blue was definitely something different. There is a lot of potential for this series and I do see so much of it. I am more than anxiously awaiting the next novel so I can see where the author has gone with the story. The little things really matter in this book and I highly suggest if you pick it up you be prepared for a slower start but a bang of a finish. For those of you that like something with more adventure than romance, you will find it in this book. I recommend this for readers that love Mermaids and are will to accept the facts up front with love!